Confirmation is the beginning of the rest of our lives as Catholics! It is the moment where you stand up for yourself, claiming that God has a primary place in your life and you are choosing to live differently because of that fact. The Holy Spirit, once again, enters your heart and stirs up the gifts God gave you at Baptism to be your truest self. If you are an adult over 18 years seeking confirmation, please go to the Christian Initiation page. Typically, Catholics are Confirmed as teenagers, and our regular process is open to High Schoolers as early as Freshman year. 2018-19 registration is open now. 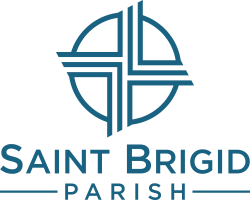 Saint Brigid Parish offers a 2 year Confirmation preparation process meeting on the second Sunday of each month. In our Diocese the minimum age for Confirmation is 15, so we encourage teens to begin their preparation as they begin 9th grade. There are times, however, that a Catholic hasn't been confirmed at the ordinary time and we certainly welcome them too. Whether you’re coming back to the Church, considering converting, or preparing to be a Godparent or sponsor, we want to help you see the Gifts of the Holy Spirit that are already at work in your life. Confirmation is all about living your Catholic faith and doing so fully, as God created you. Contact Vita to learn more.